TAMPA - City leaders say they love Tampa's downtown streetcar - but not enough to pay for a $7 million expansion. Instead, Tampa wants to dip into state and federal pocketbooks. 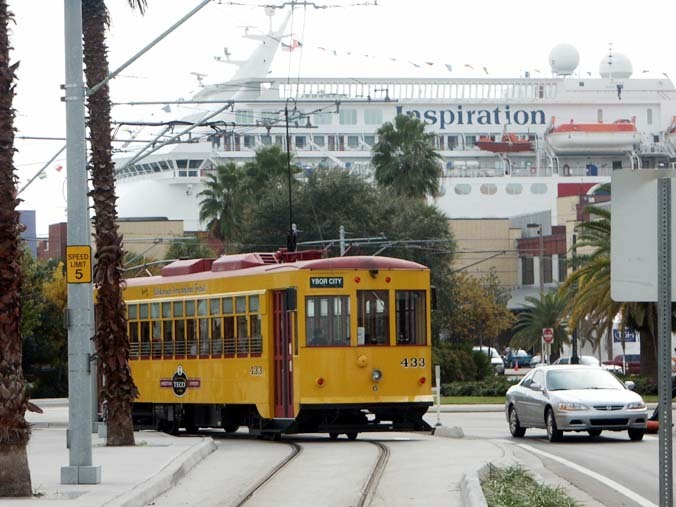 Streetcar backers propose using federal transportation money intended for projects that ease air pollution to help stretch Tampa's trolley line about 3/8-mile north by 2007. Extending the streetcar line from beside the Tampa Convention Center north to Whiting Street, near the city's Fort Brooke parking garage, could beef up ridership by luring downtown workers. Streetcar officials justify using money intended to ease traffic congestion and air pollution by saying the extension allows future downtown residents someday to use the streetcar as a commuting alternative to cars. Downtown may have many proposals for lofts and condominiums, but little has been built and few people live there. 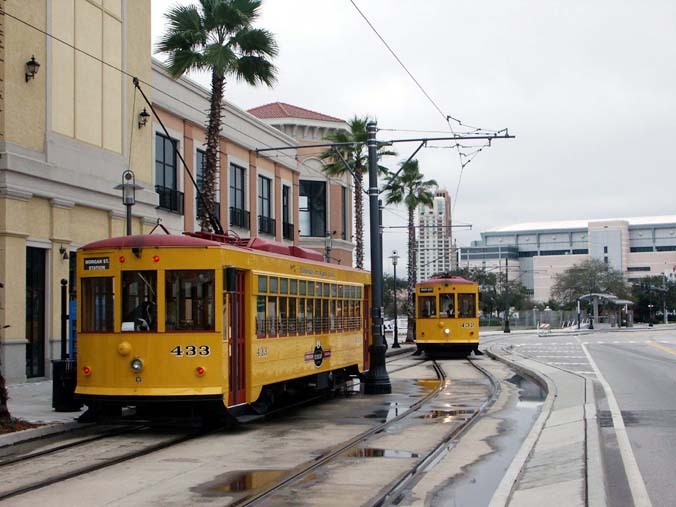 Streetcars today typically cater to tourists traveling between Ybor City and the Channel District. Streetcars don't start rolling each day until 11 a.m.
City leaders, however, say they are focused on the streetcar's transportation potential. The Tampa City Council on Thursday gave its support to pursuing $3 million in state and federal funding for the streetcar extension. The Hillsborough County Metropolitan Planning Organization plans to vote on the plan Tuesday. Streetcar representatives said state and federal money to cover the rest of the extension cost has already been requested or secured. The $63.5 million streetcar line was a joint venture between the city and the Hillsborough Area Regional Transit Authority, funded mostly by federal money with more than $10 million from the city. 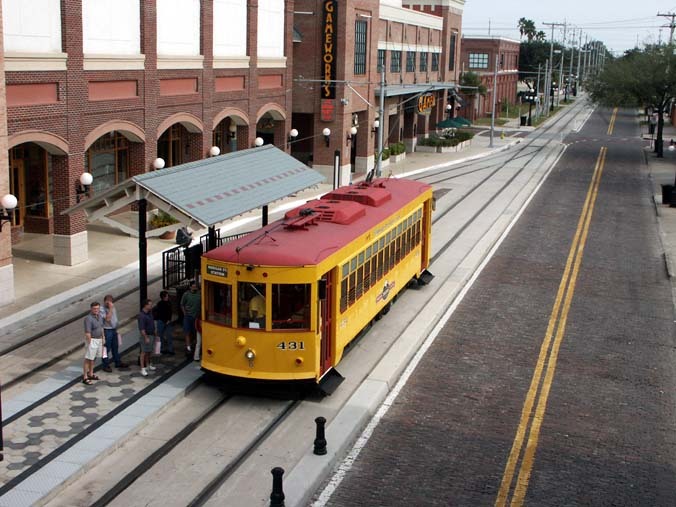 The 2.4 mile streetcar line connecting Ybor City and the Channel District started operating in October 2002. It costs $1.50 to ride one way. About 420,000 people rode the streetcar during its first year of operations, and that went up to about 425,000 during the second year, HARTline spokesman Ed Crawford said. Streetcar planners expected about 360,000 a year before the streetcar line opened, Crawford said. Ridership estimates project future increases limited to 1 or 2 percent a year without a streetcar extension, Crawford said. An extension to Whiting Street and beyond always was planned for the streetcar line, English said. Plans call for continuing the streetcar north through downtown, either on Franklin Street or Ashley Drive, and into Tampa Heights before turning east and connecting with the existing Ybor City portion. ``The expansion of the streetcar system would mean it could be much more of a real transportation system than a tourist novelty,'' City Councilwoman Linda Saul-Sena said. George Pelltier and John Hansmann, self-confessed ``snowbirds'' from Ontario, Canada, were bumming around Ybor on Thursday and jumped on the trolley for the fun of it. Jill Wax, owner of La France vintage clothing store said the trolley has helped her business by bringing people from downtown to Ybor. Her store also gets traffic from cruise ship tourists that it didn't get before the trolley started running two years ago. ``It was exactly what we needed to connect Ybor to the important areas of this part of Tampa,'' Wax said. But Jenna Kocic, the manager of the Green Iguana, said she has never heard a customer comment about the trolley. Using federal or state money to build a streetcar extension doesn't spare local taxpayers from paying to help operate the trolleys. City officials said in September that next year they might expand an annual assessment on property owners downtown and in Ybor City that helps pay for streetcar operations. Homeowners have been exempt in the past, but officials said that might end in order to tap revenue from residential development planned near the streetcar line. The streetcar assessment charges nonresidential properties about 33 cents per $1,000 of assessed property value. That is expected to generate about $345,000 of the trolley's $1.8 million budget this year. Fares paid to ride the streetcar generate about $400,000 a year. In addition to the tax and fares, streetcar revenue comes from advertising on streetcar facilities, federal grants and an endowment fund. Reporter Andy Reid can be reached at (813) 259-8409. Reporter Mike Salinero can be reached at (813) 259-8303. If the city is going to go after federal funds for a $7 million 3/8 mile extension, I think they should attempt to build a longer system now, possibly all the way through downtown, instead of doing another 1/2 mile extension a year or two later, after that one opens. I agree lakelander. If this is going to be anything more than a novelty it needs to extend at the very least to the arts district of dowtown. I'd like to see it go over the river with a stop at UT while they're there. I hope they change the operating hours. Starting at 11:00 definitely won't attract commuters. I'm not familiar with the Tampa area, could someone maybe post a map/pics? I'd like to see go up to tyle or cass. Also it doesn't really hit up any residential areas yet. So i think they're planning on getting the lunch hour crowd from downtown to lunch in ybor city. as channelside and ybor grow though, i think we'll definitely see an increase in service. Imo, from looking at the map, I'd extend it up at least to Cass and then run it along Cass, over the river to the University of Tampa's campus, with future goals to extend it into Hyde Park, West Tampa, and the Westshore areas. It would pick up a large amount of college students, looking to party in Ybor or Channelside, as well as a large number of downtown office workers looking for lunch. I just don't see the overall advantage/value of extending the $treetcar line (and thus taking up an extra lane of roadway), when you can use the trolley buses and get the same type of aesthetic for what I assume is less money. Extending the line of transportation into downtown in order to to decrease traffic congestion is completly unrealistic. AFAIK, there is only ONE streetcar lline proposed. Each car would hold around 100 people. To do a full run from ChannelSide to dowtown would take at least 15 minutes. So how many people do they believe would be able to take advantage of the streetcar so that traffic congestion can be relieved? And by being someone who has lived on Harbour Island for 5 years and has to commute through downtown to North Tampa, I ask what traffic?? Travelling north through downtown (the path the trolley is supposed to service) is ridiculously easy all things considered (I have lived in both Philadelphia and Toronto ...). In my experience, to adequately offload commuter road traffic you would need multiple public transportation routes in high frequency (every 10 minutes), with several high passenger volume vehicles (ie. trains and double length buses). In no way do I see any accomodation for this type of plan. In the end, I only see the streetcar as being a ritzy form of transportation for hotel visitors , students, and a few Harbour Island residents (those who aren't able to show up to the valet at Channelside in their +$40G cars). It would be cool if Tampa did a similar system to New Orleans, its totally plausible. The New Orleans streetcar runs down St Charles St into the Garden District, similar in many ways to the Hyde Park area. I don't see why they couldn't run a streetcar down the median of Bayshore Blvd from downtown, then cut across into the commercial/retail district. I also think the streetcar should run on the other side of I-4, in Ybor's ghetto-er neighborhood. I actually think it would work well over there. I imagine a lot of those people work in and around the area. The streetcars move to slow to take any significant amounts of traffic off of the roads. If the city is interested in getting residents to use it more, they would extend it into the working class neighborhoods north of I-4 or West Tampa. So until that happens it will continue to be used mostly by tourist, students, and office workers at lunch. That said, one thing it has been a success at, is attracting transit oriented development. Half of those loft projects and new towers proposed just north of the Crosstown, wouldn't have happened if the streetcar system wasn't in place. Another thing it does is pull tourist from Ybor into downtown, thus increasing foot traffic and opportunity for the heart of downtown. I went on a cruise last summer out of Tampa and stayed at the Marriott overnight. The streetcar was perfect, took it to Ybor the night before and took it to the Port Authority as well. It really adds a special ambiance to the area that distinguishes it from elsewhere. I suppose thats only an aesthetic reason, but in time if the city extends it futher in both directions it will catch on (assuming residences can actually get to it). Isn't there a bus dedicated road that cuts north thru downtown as well? If a weekend "drunk pass" on the trolley line got 100 or more drunk drivers off the road on Friday or Saturday night (fully extended through Downtown, UT, and Hyde Park; I could see this happening) and saved lives, it would be worth the investment. Hjack's suggestion for a diesel bus trolley might work as shuttles from, say, USF (my alma mater) to Ybor but I would invite him to ride the trolley in Tampa then come to Jacksonville and ride one of our bus-trolleys. They are totally different experiences (especially when sitting idle and the wind shifts, steering the diesel exhaust into the "trolley"). I'll be using it more often starting in April when I move to Harbour Island. I really think the streetcar adds a nice touch to the downtown Tampa area. I want people to think of Tampa when vacationing. We have access to the Beach and close by to Orlando, the theme-park capital of the world. Like Brickell, I was thinking about Marion St. as a possible route for the trolley northbound. Marion is currently blocked to all but bus traffic (it's called the Marion St. Transit Corridor or some such bureaucratic name) and I can't think losing a lane to the trolley would be a problem. But... Marion street is also a couple blocks west of where the residential developments in downtown are going. By taking the line as far as Whiting St., transportation planners are hoping to hook Trump Tower residents. But by extending the trolley up Franklin as far as at least Zack they'll grab residents from Skypoint and the eventual Maas redevelopment. Go another couple blocks to Cass and hook west, and you could put a stop in behind the library, between the Performing Arts Center and the Art Museum. I'd have to look at the rails. I'm pretty sure the streetcar doesn't run on standard rail lines, but if it does it could cross the river at Cass St. on the extant CSX line (they run two trains a day; if they're willing to let Tri-Rail use their tracks I'm sure the city of Tampa could work a deal for the streetcars) and have a stop at the college. Ever since I moved to Tampa my father (who is a train fan's train fan) has beleived the city should find some way to extend the trolley line downt the median of Bayshore. Think about that. I'm not sure I support it for aesthetic reasons, and it would cost ungodly sums of money, but with the amount of residential development down Bayshore, imagine how packed those trolleys would be with a good run through downtown and into Ybor. It would make the St. Charles Streetcar in New Orleans look vacant. I don't know about Bayshore, but in the short term, the trolley should at least be extended across the river, along either Kennedy or Swann, with stops at Hyde Park, Howard Avenue and Univ of Tampa. Connecting to the college, alone, would boost ridership significantly. I just don't see the overall advantage/value of extending the $treetcar line (and thus taking up an extra lane of roadway), when you can use the trolley buses and get the same type of aesthetic for what I assume is less money. Extending the line of transportation into downtown in order to to decrease traffic congestion is completly unrealistic. Lanes are going to be taken away from many DT streets anyways, to accomodate angled parking and bullnoses at intersections to accomodate pedestrians. Frankly, I would much rather have a trolley line running on a sensible route than have more ugly surface parking. Downtowns CANNOT thrive on rubber tired transit alone, as just about every other city in the US has learned the hard way (just as Tampa has). Considering that the puny trolley we have now has been instrumental in spurring what will soon be a few BILLION in new developments, I really wouldn't complain too much. Afterall, the tax windfall the city/county gets will keep your taxes from going up.